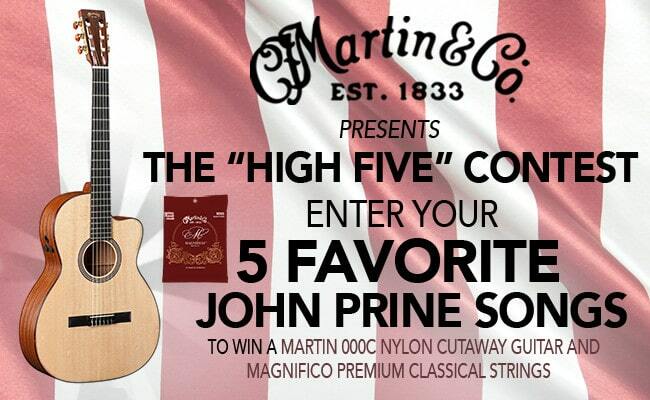 The Martin Guitar “High Five” contest is now live, and for this installment you get to name your favorite John Prine songs. The legendary singer-songwriter will appear on the cover of the May/June issue of American Songwriter. And be sure to check out his new album,The Tree Of Forgiveness, which comes out April 13. Prizes for this contest include a Martin 000C Nylon Cutaway and a pack of Magnifico Premium Classical Strings. Martin’s 000C Nylon Cutaway features a wide neck, slotted headstock and classical style bridge. The 000C Nylon is crafted with solid wood and features a gloss top. This beauty comes stage-ready with onboard Fishman F1 Analog electronics and it includes sustainable wood certified parts. Martin’s premium classical strings are made with a proprietary synthetic material, developed exclusively with Aquila, that is tonally superior to standard nylon strings. These premium strings emulate gut strings that have been around for centuries and they offer precise intonation and exceptional tuning stability. MagnificoTM strings are offered in normal and hard tensions. Want to win? Simply fill out the form below and tell us your “5 Favorite John Prine Songs” and you’ll be entered to win the guitar and strings. Selected entries will be printed in our July/August 2018 issue. Deadline: May 31st, 2018 at 11:59pm CST.